When you have a damaged tooth in need of a restoration, having to wait multiple appointments can feel like an eternity. 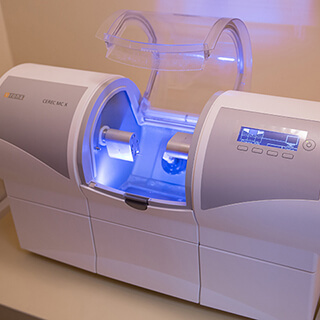 At Dr. Mitchell’s office in East Point, we’re thrilled to merge convenience with the same standard of excellent, personalized care we’re known for – that’s why our team has invested in the revolutionary CEREC machine. Now, the design, milling, and placement of a brand-new crown or other restoration can be completed in a single appointment! Continue reading to learn more about how this process works, or contact us today to schedule your very own appointment! Treatment Planning – First, Dr. Mitchell will carefully inspect the tooth and help you determine what type of restoration would correct the issue best (for instance, whether a crown or a inlay/onlay is the right choice). Then, he will carefully remove any infected tissue/structure and reshape the tooth as necessary. Digital Impressions – Our team will complete a digital impression of the affected tooth/teeth, which only takes a few minutes and is instantly transferred to the CEREC’s system. Three-Dimensional Model – The advanced CEREC software takes the comprehensive image of the tooth and converts it into a 3D model. This allows Dr. Mitchell to design the new crown or other restoration while ensuring a high level of accuracy. On-Site Milling – Once the design is complete, it is sent to the in-house milling unit, which takes a block of high-quality ceramic and creates the new restoration per the doctor’s precise instructions. This process only takes around half an hour to complete. Permanent Placement – After the new restoration is finished, Dr. Mitchell will inspect it, ensure that it fits well within your mouth, and make any last-minute adjustments. When ready, he will secure it into place over the affected tooth/teeth. With CEREC, there are no uncomfortable temporary restorations or gag-inducing impression materials to worry about. Instead, you walk in with a broken tooth and walk out with a recompleted smile that’s better than ever!